Like any other typical Filipino, street food has always been on top of my list when it comes to unique dining experience. I remember before I go home after a long hours in school I asked my schoolmates to go to our favorite place. I always make sure to grabbed Squid balls from Manong Mario which served with vinegar dipping sauce. I loved street foods from isaw to kwek kwek. When my friend and colleague from Brentwood Hotel in Wellington, New Zealand, Chef Archie Juanta, in 2007 established Lime 88 “Street food na Pina-Sosyal” in Mandaluyong City which offers a wide variety of street food with culinary twists. Such as Balut in Red wine, Adobo Sushi, kangkong and kesong puti stuffed chicken breast and Lime’s Quail egg ( Kwek-kwek) tempura looks classy served with Soy Mirin Glaze and sinamak. I was waiting for someone who will open a similar restaurant in Wellington but no one brave to do it. 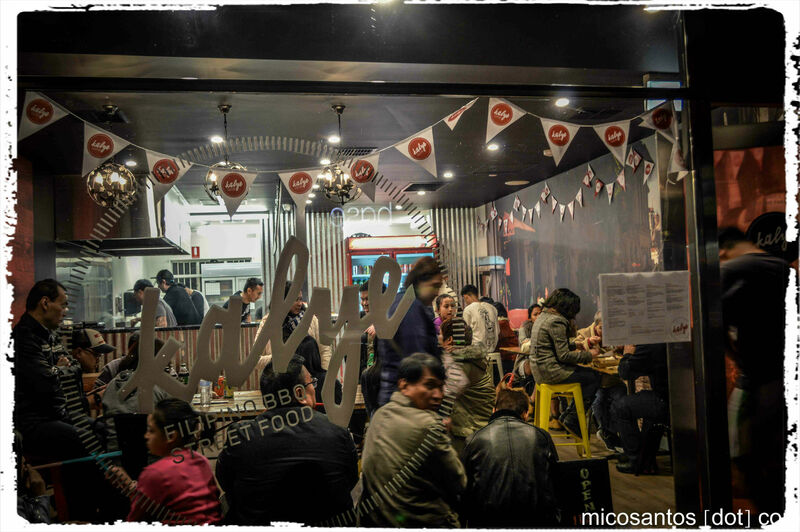 However, I feel something missing with their Filipino menus – the Street foods that I loved . A friend of mine told me about a new Filipino Restaurant along The Parade in Norwood called “Kalye which offers a street foods. Last Thursday, I decided to check the newly opened restaurant during the night , the resto was jampacked with people but I never expected the place was a little bit small – One long table and three small tables . Anyway, the staff are very friendly and they greeted you as you entered the door. The menu is simple and they also do a take away . As the Kalye says nothing compares to the aroma of authentic Filipino inihaw( BBQ), in the Philippines street food vendors in almost every corner sell various kind of marinate meat cooked in open charcoal grills. So, I order a 2 pcs of Porky-Q skewer for $8 but you can also get a meals ($13) served with rice, pickled green papaya,fresh salad with vinegar/soy dipping sauce and my wife order a sizzling Pork Belly sisig ($15) juicy grilled and finely diced pork belly served with mince onions, pork crackling,egg and mayo . For the kids, a Liempo Meals ($12) served with rice,pickled green papaya fresh salad with vinegar/soy dipping sauce. The dish was presented in a take away cardboard container which is good , if the customer doesn’t want to eat their food at the Restaurant . The Pork-Q skewer were fantastic and delicious you can smell and taste the chargrilled flavours , Congratulations to the Kalye Grillmaster , he knows the authentic Filipino Inihaw (BBQ). However, Pork belly Sisig were just like a ordinary sisig nothing special compared to Tita Kay’s dish. 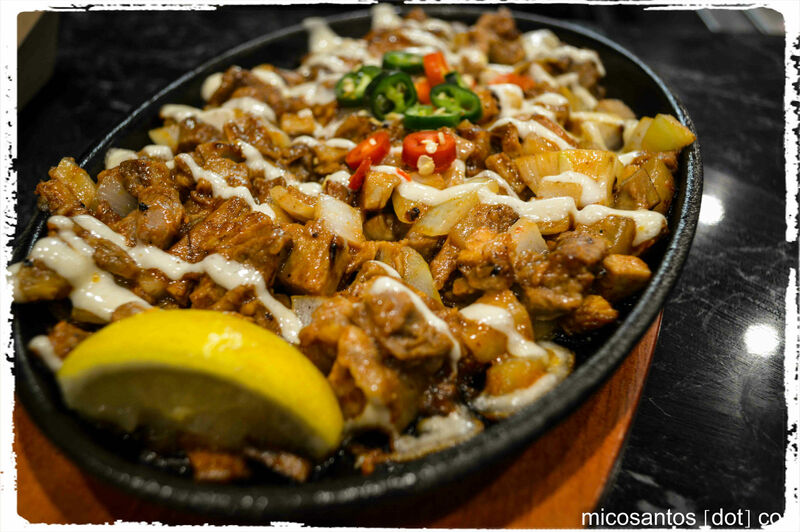 Something is missing with their sisig but overall the place was fantastic and the staff were friendly and the service was above average. Please check my photos at aMikothing. Please check Kalye located at Unit 1/219 The parade Norwood SA 5069 or check their facebook .